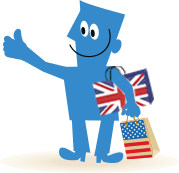 Borderlinx | Buy D-Toy Germany and ship worldwide with Borderlinx. Cheap rates guaranteed. At D-Toy Germany, a relatively new store, its staff and products are here to help you with your quest when you are looking for toys for your children, your list of what to look for includes educational and safe products to motivate your kid's mind. D-Toy Germany products are based on investigations and findings in the field of pedagogy, and are created to be environmentally safe, original, fun, and educational for your child. D-Toy Germany offers diverse toys for all age groups: baby toys, toys for outdoor use, classical toys, and more than you can imagine. D-Toy Germany Shop is the perfect one-stop-place for your kid's desires, with a large selection of products available, that are also selected to meet your budget. Remember: kids are like a sponge, the more they interact with, the more they learn, making these toys completely suitable for your child. D-Toy Germany also cares about educating, helping and working alongside the customers to deliver a full service, which helps parents to feel comfortable with the company and trust them when making a decision. You may think it is hard to obtain D-Toy Germany products in the comfort of your house, but from now on customers can obtain D-Toy Germany Toys through the website and ask them to be shipped to 64 countries worldwide with Borderlinx. Also, you can determine cheap rates (shipping, taxes and duties) using our shipping cost calculator, and prepare your shipment through Borderlinx, in order to get it to your home.A number of services are available through Borderlinx to make international ordering from D-Toy Germany hassle-free, including shipment value protection, free repacking and consolidation services.